The 4th of July heat was felt all across Nashville, especially for folks at the Music City Hot Chicken Festival. The parade started at 10:30 Wednesday morning at 8th and Woodland with former mayor and festival founder Bill Purcell leading the charge. 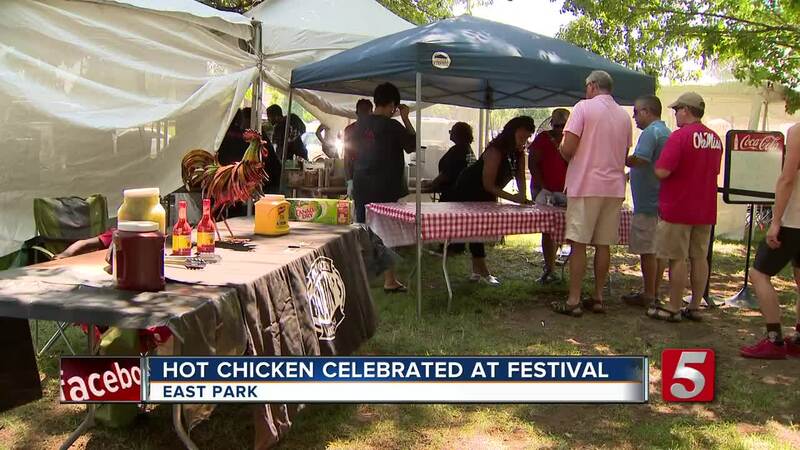 After that, dozens of hot chicken vendors including Prince’s Hot Chicken, Bolton’s Spicy Chicken and Fish, 400 Degrees, Chicken Shack Express, Pepperfire, Hattie B’s, and Party Fowl set up shop at East Park. Long lines formed as people waited to brave the hot chicken burn. The winner of the ameteur hot chicken contest was Team Big Steve and the Hot Chickadees. Big Steve and the Hot Chickadees: spearheaded by Steven Younes is back after taking a hiatus to try and improve on his second-place finish in 2016. His reason for not competing last year? Fearing hot chicken might cause and early birth, Steve and his wife decided to sit out until their daughter was born. Now they’re back with a new chickadee and ready to capture the trophy.